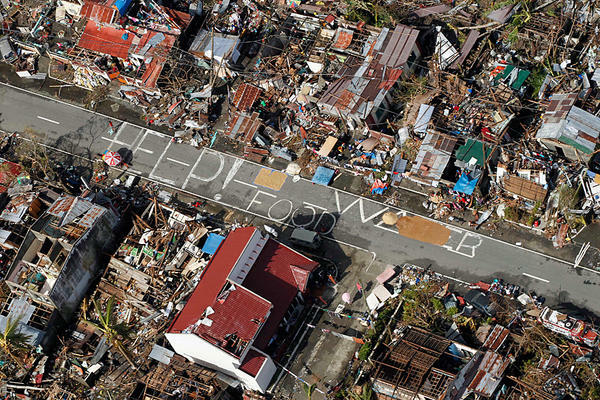 Typhoon Haiyan has been a personal tragedy for many Filipinos. The pictures of destruction, the heartrending stories of loss and the inability to get aid delivered quickly because of damage to infrastructure highlighted once again the terrible forces that Nature can unleash. This coincided with the latest round of climate change negotiations in Warsaw, at which the head of the Philippines delegation made an impassioned and tearful plea for mitigation action to reduce the chance of future catastrophes. While it may seem uncaring to criticise someone in his position, he was wrong. The first reason he was wrong is that there is nothing in the record to suggest that tropical storms are getting either more frequent (a claim which used to be made but which has now been quietly dropped) or more intense (the current focus of attention). The hypothesis is that, in a warming world, more heat is stored in the oceans and this can in turn provide more energy to create and drive powerful storms. However, things are more complex than that, and the fact that the temperature differential between the polar and equatorial regions is lessening also reduces the enormous flow of energy from the tropics, which drives such storms. The second reason is more fundamental: some regions will always be subject to periodic extreme weather whatever tinkering humans engage in. Tropical storms will continue to occur, and anything in their path is vulnerable. The Philippines, as well as Vietnam and other South East Asian countries, will be hit by typhoons every season, just as the Caribbean and southern states of the USA suffer from hurricanes on a regular basis. The number of storms varies from year to year, as does their intensity, but it is where they make landfall that is most important in terms of human impact. Hurricane Katrina was not a highest category storm, but caused destruction because it hit a densely populated area with inadequate flood defences. Similarly, the city of Tacloban was not only battered by exceptional winds, but was also overwhelmed by a wall of water intensified by the local geography. Extreme weather will continue to wreak havoc in vulnerable areas. Tropical storms will hit low-lying coastal areas, while cyclical drought in, for example, parts of Africa will threaten food supplies and livelihoods. Floods will hit the same areas with monotonous regularity, with extreme rainfall pushing these to a Biblical scale on occasions. All these will occur whatever steps governments do or do not take to reduce carbon dioxide emissions. What is more pressing is to make communities at risk as resilient as possible to whatever weather they may experience. There are plenty of examples of this happening already, with numbers of fatalities having been much reduced thereby. In areas of tectonic activity, buildings are erected with foundations and structures that can absorb much of the energy of earthquakes. And while very little can withstand the onslaught of a massive hurricane or tidal wave, weather warnings, storm shelters and evacuation procedures make sure that the human cost is minimised. But, it is prosperous countries that can afford to invest in flood defences and the communications network and physical infrastructure needed to warn and evacuate populations in the path of impending catastrophe; poor countries often suffer more. Pretty much the whole of the Netherlands would either not exist or be prone to severe flooding were it not for the sea defences erected over the centuries. Bangladesh and other low-lying countries could be similarly transformed if they had the resources. Instead of focusing on issues like this, the world’s governments are engaged in a series of lengthy and inconclusive talks in a bid to reach agreement on a comprehensive global plan for a drastic reduction of carbon dioxide emissions. This, we are told, is the only way to avoid a potentially catastrophic degree of global warming over this and coming centuries. However, after the failure of the 2009 Copenhagen summit, touted at the time as a make or break moment, little real progress has been made as the travelling circus of thousands of negotiators, politicians and climate campaigners moves from conference centre to conference centre. China has been the world’s largest single emitter of carbon dioxide for a number of years, and there is a steadily increasing gap between it and the USA, as coal remains the main driver of its continued economic growth. Its per capita emissions are now up to the same level as the EU average, while its population is more than two and a half times larger. Some of the countries signed up to the Kyoto protocol are wavering: Canada has left the protocol, Australia’s new government is in the process of dismantling its recently-introduced measures, and Japan has now changed its own commitment to a much less demanding target. Even in countries such as Germany and the UK, whose governments (despite internal tensions) continue to roll out large-scale renewable energy programmes, the costs involved are beginning to create a consumer backlash. Japan is putting more funds towards developing economic renewable energy systems, in particular, ways to store massive amounts of energy efficiently until it is needed. In the meantime, efforts to cut global emissions to 80% of 1990 levels by 2050 are doomed to failure. They are helping no one and making not an iota of difference to the chances of further intense tropical storms hitting population centres. The priority must surely be to protect vulnerable areas over the next few decades rather than to gamble on lessening the risk of extreme weather in the second half of the century. What Can Reversion Points Teach Us About Public Policy?